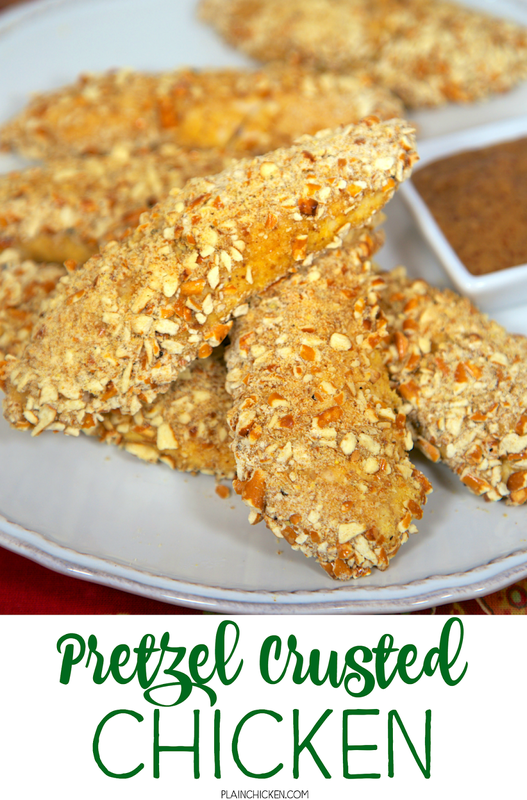 Pretzel Crusted Chicken Tenders - chicken coated in cornmeal, dijon mustard, garlic and pretzels then baked. Ready in under 20 minutes! My husband raves about these! He asks me to make them at least once a week! SO good! Can coat and freeze for later!! 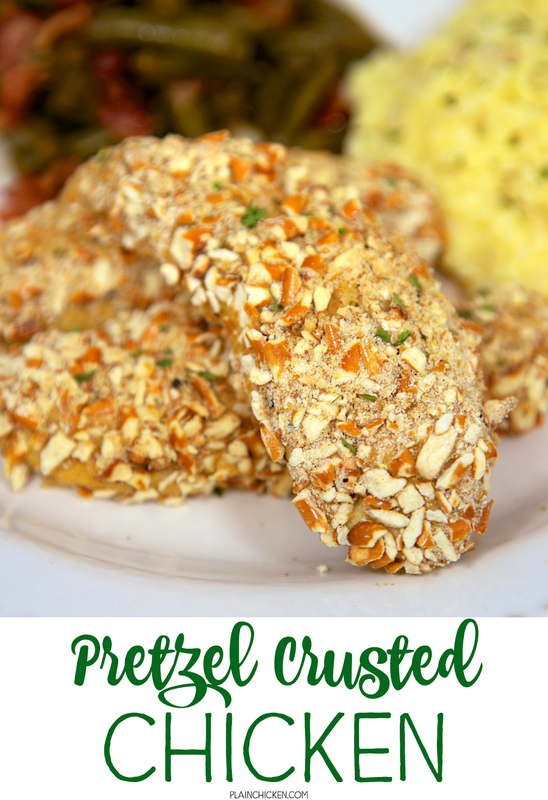 These Pretzel Crusted Chicken Tenders were a huge hit at our house. I've made them several times and Chicken Legs raves about them every single time. I agree with him, this chicken is crazy good! The best part is that they are super simple to make and are ready to eat in under 20 minutes! 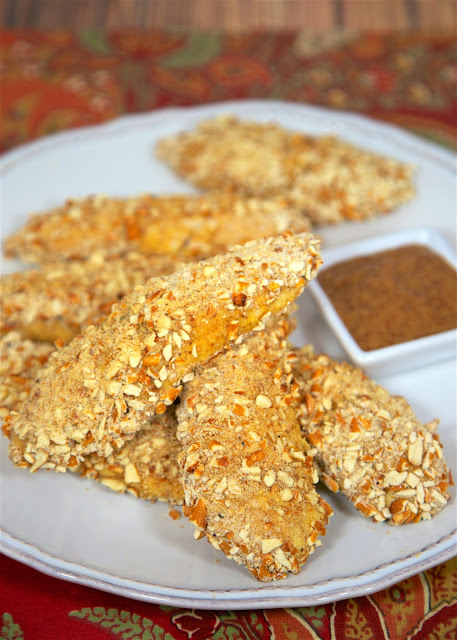 I prefer to bake chicken tenders instead of frying them. I don't like the mess and smell of grease in the kitchen. (And Chicken Legs especially doesn't like to clean it up!) If you are pressed for time, you could always coat the chicken and freeze them for later. Place 4 Tbsp cornmeal in shallow dish. Whisk toghether milk, dijon mustard and egg in a separate shallow dish. Combine remaining tablespoon of cornmeal, crushed pretzels, garlic powder, sugar and pepper in a third shallow dish. 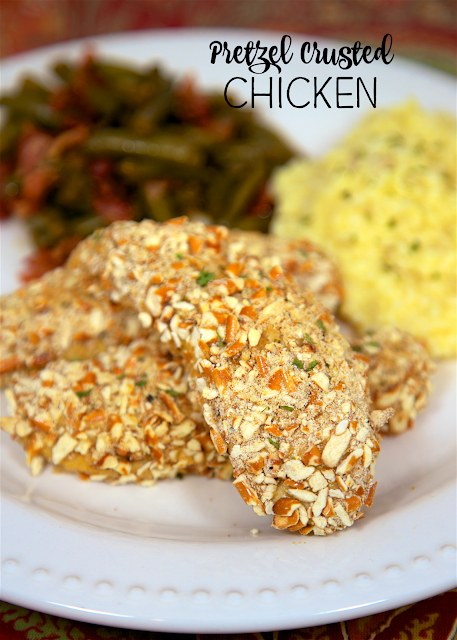 Coat chicken in cornmeal. Shake off excess. Dip in egg mixture. Coat in pretzel mixture. Place on baking sheet. Repeat with remaining chicken tenders. Lightly spray chicken tenders with cooking spray. Bake for 15 - 18 minutes, until juices run clear.